Last week Neil and I traded our keyboards and mice for a transit van filled with exhibition equipment, half a tonne of assorted promotional items and a rainy afternoon on the M4. Our mission, to capture the attentions of a good chunk of the 12,500 attendees to InfoSecurity Europe and talk to them about our core products, BackupAssist, MailStore and MDaemon. With the theme to Max and Paddy’s Road to Nowhere still fresh in our minds we arrived at Earl’s Court to join the hive of activity as exhibitors and contractors alike were all going about bringing their shop windows up to scratch for the 6pm deadline. A few hours and some fairly major complications later (courtesy of the booth construction company), we were set and ready to pitch our wares the following morning. The three days that followed started off with a steep learning curve as we fine-tuned our pitches and found that right balance between waiting for visitors to come to us and dragging them in off the aisles. Once up to speed though the show proved a great success in terms of new business and a perfect opportunity to catch up with existing partners, customers and suppliers. Below you’ll find a link to our InfoSec gallery including shots of some of the other surprise guests to our stand, including The Stig, Halo’s Master Chief and another indiscriminate robot with feet too large to press one pedal at a time. 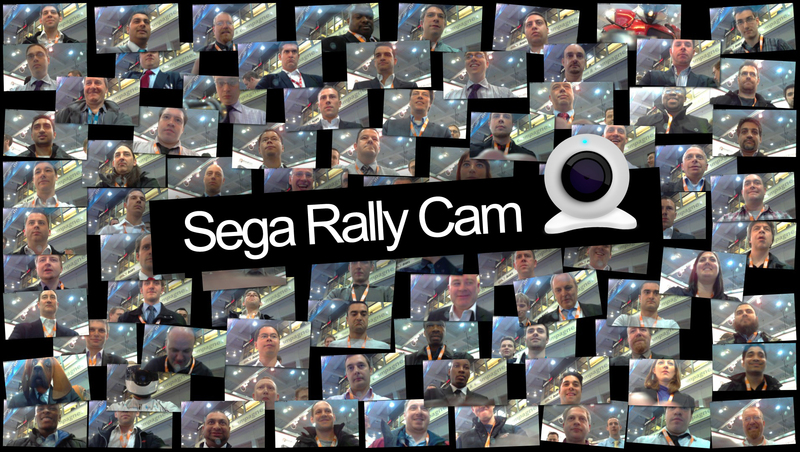 Oh yes, we couldn’t resist setting up a webcam in the Sega Rally cabinet to capture those faces of concentration as visitors tried their luck at winning those GP tickets – so below is a selection of the best snaps…. Special thanks to Steven and Linus from BackupAssist who kept us in high spirits, talking to customers about the product roadmap while simultaneously dishing out their authentic Aussie freebies, including clip-on Koalas (the hit of the show! ), keychain boomerangs and Tim Tams. Thanks also to Heinz Wietfeld from MailStore for helping us out on the third day and to Seema and Emmet who provided much needed reinforcements. As you may recall, we were giving away two free tickets to the British Formula 1 Grand Prix this year to whoever set the fastest lap on our original Sega Rally arcade machine over the course of three days. The competition was hard fought with two seconds covering the top nine entrants but I’m very pleased to announce that the tickets are going to Adam Keesey from Clevedon based Cablecom Networking who set a blistering time of 54.7 secs with only two hours left to go of the show on the final day! Thanks again to those of you who made it down to say hello and we look forward to catching you there again next year, if not sooner.